This summer heralds in a new and challenging phase of environmental health and safety (EHS) regulation reporting. Starting in July 2018, the Occupational Safety and Health Administration (OSHA) will require businesses across the U.S. to submit workplace illness and injury reports digitally. Unfortunately, many businesses have yet to make the shift to managing their EHS data digitally, putting them at risk of significant fines. For these companies, workflows such as safety meetings, safety inspections and accident reports documented on paper forms or spreadsheets and mailed to OSHA are still the norm. It’s a time-consuming and error-prone process that also delays accident and incident reporting to both business managers and OSHA. With non-compliance fines starting at over $10,000, it’s a problem that companies can’t afford to ignore. But compliance isn’t just a legal mandate; observing safety rules also creates a safer, healthier workplace culture for all—which equates to more productive and happier employees. But digital transformation can seem like a huge undertaking. Truth is, it doesn’t have to be an all-in approach. Today, out-of-the-box digital tools and processes take the hard work out of meeting OSHA’s new reporting requirements and move companies up the digital transformation maturity ladder, at a pace that works for them, with no coding. If you’re looking to move away from manual, paper-intensive EHS workflows and achieve OSHA compliance, while implementing good employer safety practices, following are five things to consider. EHS compliance checklists can vary across industry and even from facility-to-facility. As such, businesses need the flexibility to create checklists specific to their needs. Cloud-based EHS apps provide out-of-the-box, fully-customizable compliance checklists and forms digitized for use on any smart device. Instead of sifting through regulations to understand which applies in each case, these apps do the thinking for you. A safety manager simply fills in the details of the incident and the app does the rest, crosschecking all the relevant regulations. This intuitive approach removes any error from the equation and ensures the business has more confidence in its data for internal purposes and OSHA reporting. In the regulatory environment, the winds of change are never not in the forecast. 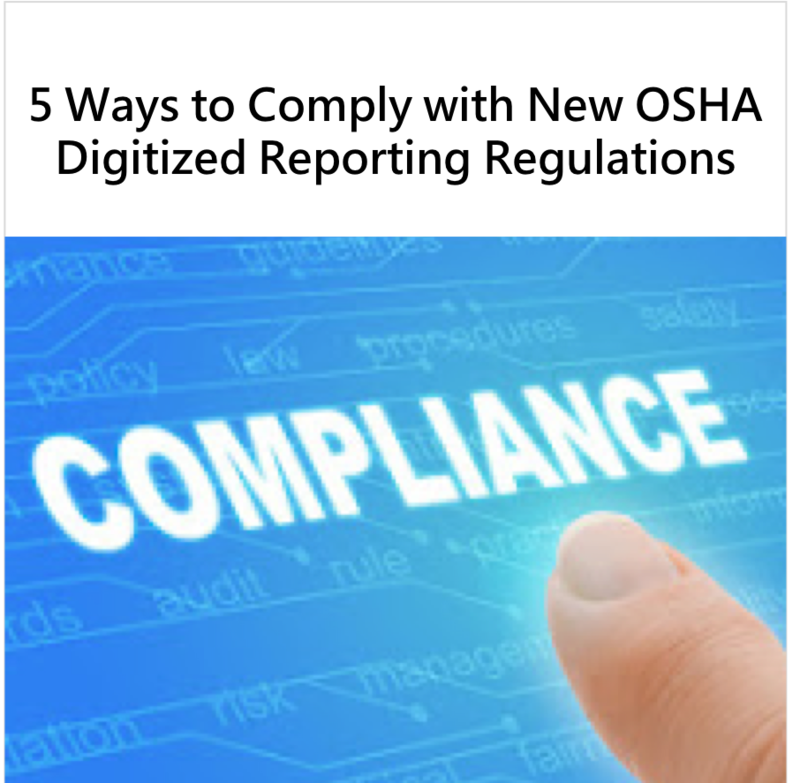 To ensure compliance with current and future OSHA regulations, businesses can benefit from a digitized workflow that simplifies ongoing compliance. That’s the advantage of a cloud-based approach. As regulations change, apps that allow for no-code updates through a central console then roll those changes out to all devices automatically, which helps give safety managers the confidence that they are collecting the right information, at the right juncture. Creating a culture of compliance is important, but equally so is cultivating a culture that emphasizes workplace safety. A safety-centric culture refers to how EHS is managed in the workplace—the attitudes, values, beliefs and ways of doing things. It’s a shared commitment across managers and employees towards ensuring a safe work environment and is the first line of defense against injury and accidents. Think of it this way: While OSHA is the sanction, EHS is the culture. If that culture is not in place, then any number of tools or technology fixes aren’t likely to move the needle on compliance or employee health and safety. Fostering a culture of safety starts at the top. To this end, executive management must commit to providing the resources, tools, training (OHSA offers a number of programs to help businesses do their work safely), and guidance needed to help employees work safely. With the right tone and commitment set at the top, credibility and momentum for such a culture will trickle down throughout the organization. Top-down leadership is the first step towards cultivating a workplace safety culture, but the onus doesn’t have to be all on the C-suite. Companies must invest in the right tools and technology that enable that culture. Why? Legacy paper-based processes add complexity to the tracking and management of regulations and fail to scale as companies grow. Not only are these workflows a burden and a liability, their very unwieldiness stymies the adoption of an EHS culture—staff are over-extended, bogged down in manual, tedious processes when their time could be better utilized elsewhere to help prevent incidents. Bespoke solutions used to be the answer but lack the flexibility to scale with the business or adopt to the changing regulatory environment, without the need for costly programming help. The impact? The business remains bound by a rigid structure, opening it up to non-compliance and an inability to adapt to changing working practices. Today’s technology applications offer advanced solutions that can help support and sustain a culture of EHS excellence. Digital EHS apps include ready-baked software that enables instant compliance (no need to build your own system) across the various needs of the business, while being flexible enough to keep pace with change in a streamlined, seamless and non-impactful way. A critical yet often overlooked best practice for changing the way your business approaches environmental health and safety is learning from the data at its fingertips. Improvements in accuracy and speed of reporting brought about by digitized workflows help paint a more complete and detailed picture of what is happening in the field. Using real-time data rather than sifting through mounds of paper, companies can extract, analyze, share and apply those data insights to prevent future problems and improve working conditions. On the financial front, that represents a potentially huge savings in terms of insurance, lost man-hours, and of course avoiding giant fines from OSHA. 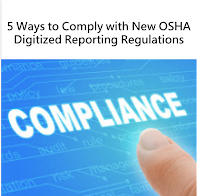 In conclusion, compliance with OSHA’s new digital reporting regulations is an impetus that all organizations should embrace to modernize key business processes. In addition to risk-mitigation, digitizing your EHS workflow brings a multitude of benefits that can drive business transformation and modernization—providing more visibility across the business, freeing up employees and resources, and bringing new data insights.